The easterlies and sunshine continued, Richard arrived on Wednesday to bring the Wardening team up to full strength and so it was straight into census (we often break into things gently at the start of the season, but given the weather, Ciaran was run through the three census areas in a day and a half and Richard was sent straight into the North on his first afternoon back!). The birds haven’t flooded in, but there have been new arrivals and it’s been a pleasant start to the season. This time last year Richard’s first experience of North census involved us trying to negotiate our way down Ward Hill in the snow, so it’s a quite a contrast. The difference in the weather is also highlighted by the arrival dates of Wheatear and Chiffchaff this year both falling on 25th March, rather than the 10th and 11th April respectively last year. Although there isn’t a major fall (…yet? The overnight north-easterlies and rain could prove interesting), the birding really is rather pleasant, with the island scattered with migrants. On 26th there were 12 Robin, 10 Chiffchaff, 9 Dunnock (the first of the year and always a species that somehow makes it feel like there's really something good going on), 8 Goldcrest, 4 Chaffinch, 4 Woodpigeon, 3 Reed Bunting, Stonechat (a male found by Hollie from horseback at Barkland, which may have been the bird seen the previous day near the Plantation and did get us wondering whether census by horse is the way forward), Wheatear, Siskin (a male replacing the female in the Obs garden) and Collared Dove, with the highlight being the ringtail Hen Harrier, which avoided the Wardening team but was seen by a couple of islanders. It may not be a startling species list and the numbers are probably bettered by a few of your gardens, but after a long, windy winter, it’s good to be amongst the birds again at a time of year that can often still be rather wintry. The 27th saw a similar range of species present, although numbers were generally similar or slightly lower than 26th despite some new arrivals (e.g. the 2 Woodpigeons on the North cliffs were probably new, but don’t look that impressive in the Log, being only half the number of the previous day). The only species showing increases were Goldcrest (to 10), Wheatear (to 3) and the first Black Redstarts of the year, with 3 scattered across the island. Lingering fare included the Kumlien’s Gull and an Iceland Gull (26th) and 2 Glaucous Gulls (27th), whilst a pair of Peregrine tussling over the airstrip on 27th were possibly getting friendly as spring advanced. With Fair Isle Wrens in full song, auks and Kittiwakes back on the cliffs and a few flowers blooming, it’s starting to feel like spring is really here (although there’s still the chance of snow anytime in the next six weeks or so! ), hopefully there’ll be a few more birds soon as well. White-spotted Bluethroat tomorrow maybe, or perhaps (playing safe) a Hawfinch? Whatever happens, it’s exciting, it’s great to have the Obs buzzing with anticipation, it’s great to be back. 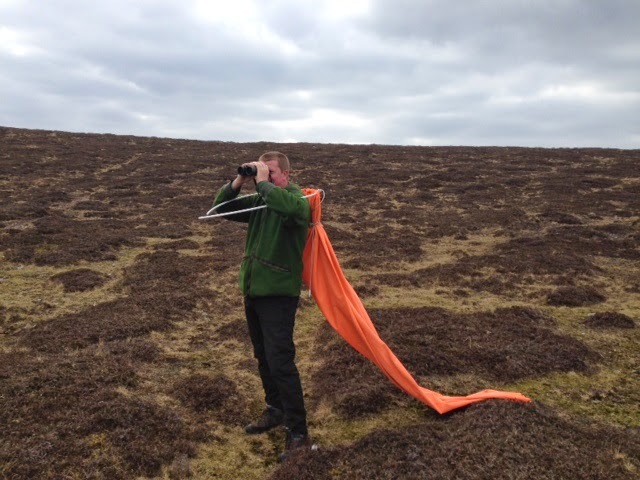 The gusty gales last week took the windsock off the airstrip, which Ciaran and I found on Byerwalls today. I don't think capes are going to become standard issue for the Wardening team though.